My Ten Friends Clusterfrak, Here is another MTF for you that I am so in love with. Almost as much in love as I am with Dirtball. 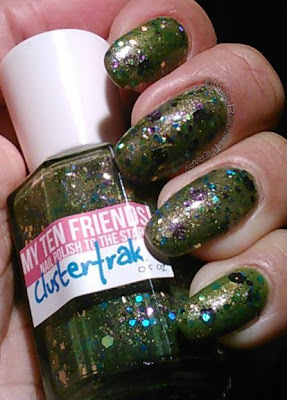 Clusterfrak has a similar formula which goes on in 2 easy coats for full opacity. 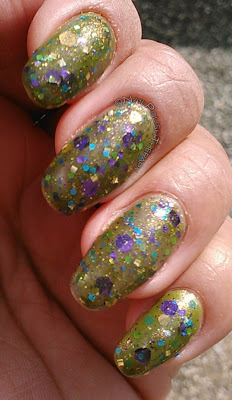 It is CHOCK full of amazing combo of purple, green and gold glitter. What I love about this polish is the green base and the XL purple and gold hex glitter. I think XL glitter makes the color pop. Unfortunately the glitter has been prone to curl, so Mei-Lynn being the perfectionist she is let me know if this problem and gave me the option to get another color or put the glitter on the side. I love those large hex glitter so I took it on the side. I'm glad I did that because it allowed me to place those babies exactly where I wanted to and didn't have to fish them out the bottle. I had no problem with the glitter curling when I sandwiched them between two coats. This is such a beauty! I can't wait for the next order of MTF to arrive.